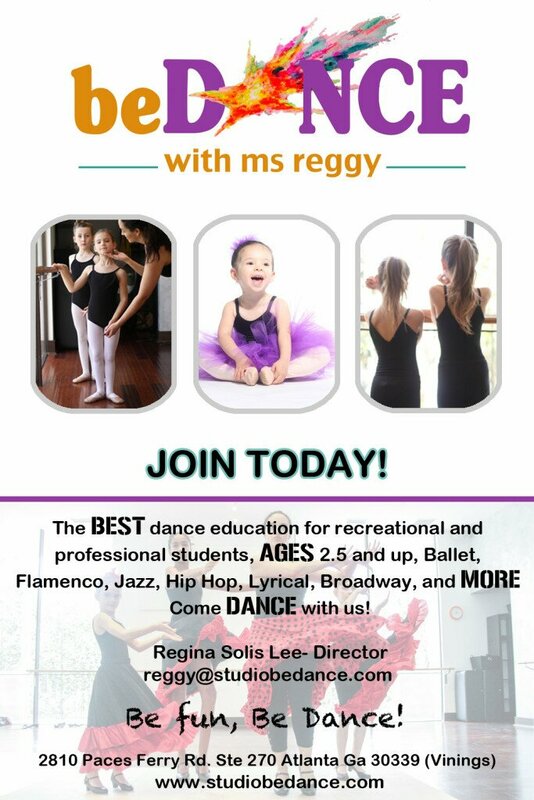 Be Dance with Ms. Reggy is a new studio in the heart of Vinings offering a wide variety of dance classes for kiddos and mamas alike. The artistic director is Regina Solis Lee who has been dancing since the age of 3, and includes a position as a dancer with the Atlanta Hawks Cheerleaders in her experience. Aside from her new studio, she also professionally acts and dances Flamenco with the Calo Theatre Company. My 3 year old goes to preschool with Regina’s son and that’s how I discovered her classes. I thought a class of 2 to 3 year olds would be about as successful as a cat rodeo, but I have been more than pleasantly surprised! Ms. Reggy is absolutely wonderful with the girls and they are actually picking up not just one, but 2 dance routines. One is a sweet ballet piece set to Beauty and the Beast and the other is an upbeat Flamenco number with a catchy song that sticks in your mind. The girls seem to just love learning their turns, walking like ballerinas and sweeping her their hands in graceful Flamenco “flowers”. We joined the group at the beginning of the school year when they were still in a shared space in Buckhead, but we are thrilled to be closer to home in the new Vinings location. The new spot brings new students, more class offerings and a focus on the May recital. The classes include Mommy & Me, ballet & Flamenco for 2.5-3 year olds, and a variety of classes for older kids with Jazz/Hip Hop, Acro and Creative Movement in addition to ballet and Flamenco. Some of the newer offerings for adults include Yoga, ballet and Flamenco. All of the courses and tuition fees can be found on their website. 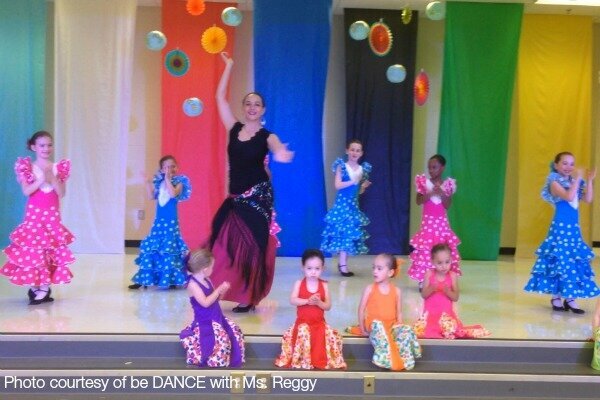 Reggy has pointed out to me that Flamenco is one dance form where you can continue to excel no matter what age you begin…I haven’t exactly strapped on taps yet, but I’m happy to watch my little one go! You can also check out pictures of all the dancers on her facebook page. New students are welcome – and the first class is always free. However, we’re getting close to the cutoff for participation in the recital, which will take place at the end of May, so if you’re interested, sign up soon. If you miss the timing for this season, there’s also a new opportunity to be part of her summer program. It will feature all aspects of musical theater and feature a production of the Princess and the Frog. Come and join Ms Reggy, Be Creative, Be Unique, Be Dance.